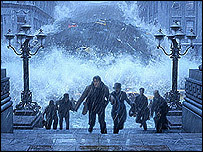 A worldwide experiment to test the plausibility of the disaster movie The Day After Tomorrow starts on 22 June. Computer users across the world are being invited to download and run a climate model of what may happen this century. The test will see how predictions may change if the behaviour of the Gulf Stream is affected, as the film shows. The project is the work of climateprediction.net, a consortium of UK universities and the Met Office. Last September the group launched a global online effort to generate "the world's most comprehensive probability-based forecast of 21st century climate". 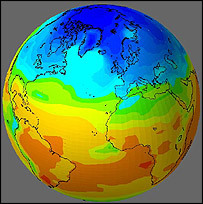 Visitors to its website were able to download a unique version of the Met Office's climate model, simulating several decades of global climate at a time. That experiment has recruited 49,000 participants in 130 countries, but the new one aims to go further. Dr David Frame, the project coordinator, said: "So far we have been asking people to simulate how the climate could respond to rising carbon dioxide levels. "Now we are extending the project to investigate how predictions might change if the thermo-haline circulation in the oceans were to slow down, altering the flow of the Gulf Stream." Dr Mat Collins of the Met Office said: "Extreme scenarios make great films, but for practical planning we need to know how likely it is that such events will actually happen." The University of Oxford scientist leading the experiment is Nick Faull. He said: "We are not trying to predict the odds on a shut-down of the thermo-haline circulation, but we are asking: 'If it did happen, what are the chances it would offset the warming due to rising greenhouse gases and cause a cooling? What consequences would it have for the atmosphere and oceans?'" Anyone wanting to join the experiment can download a secure software package, including a version of the Met Office's state-of-the-art climate model, from the climateprediction.net site. Each model, the organisers say, is a slightly different but "physically plausible" representation of processes going on in the atmosphere, land and near-surface ocean. The model will run for a few weeks as a background process on an ordinary desktop computer without interfering with other computing tasks. Interactive graphics will let participants watch as their computer calculates how the weather in their model responds, first to a rise in carbon dioxide and then to a thermo-haline shut-down. The results are finally sent back to the organisers on the internet. Carl Christensen, the project's chief computer scientist, said: "There is no way we could complete an experiment this size even using the world's biggest supercomputer. "The project has really captured the world's imagination: anyone can join in." "Britain's Met office is among those enthusiastically backing what's being called the weather forecast for the next 96 years"